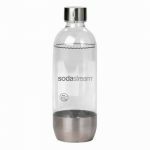 SodaStream offers a wide variety of different carbonating bottles that differ through their size and construction. Most SodaStream machines come with the default plastic carbonating bottle. While this one isn’t too bad, it certainly isn’t as sturdy and solid as the stainless steel version. 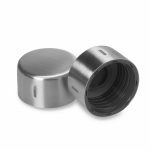 The stainless steel version has a stainless steel cap and bottom. 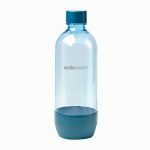 It is made of BPA free PET plastic like the other carbonating bottles and comes in 2 variants: one compatible with every SodaStream machine except the Penguin and Crystal and another that is only compatible with the SodaStream Play, Source and Power. The big difference is that the one compatible with only the Play, Source and Power has a slimmer figure and a more aesthetic look. They can both be bought on the SodaStream website. 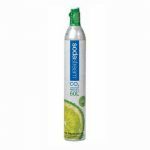 SodaStream also offers 0.5L stainless steel or plastic carbonating bottles. Even though the cap is supposed to keep a hermetic seal that stops any fizz from escaping, the sparkling water will still naturally lose a bit of fizz. Therefore, for those who won’t drink the full contents of the 1L bottle within 24 hours, it would be helpful to buy a smaller sized bottle and not have to deal with the water losing some of its carbonation. 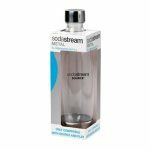 The plastic versions cost can be bought in a two pack whereas the stainless steel one is bought individually and is only compatible with the SodaStream Source, Play and Power. Also, SodaStream has some colorful options available, notably in red, green, orange and yellow. These colored carbonating bottles are available in 0.5L and 1L variants. These are identical in shape to the ones that come with most soda makers. The regular carbonating bottles are quite drab so these are helpful if you want to make your SodaStream machine even more appealing. They are also great for kids since they love bright colors. They can be bought in a twin pack. On top of that, SodaStream has a variant of carbonating bottle that is dishwasher safe. This is the one with the most practical application since all other carbonating bottles need to be hand washed with dishwashing liquid and water. This can be quite a hassle with the relatively small bottle openings that make it hard for you to rinse out all the soap. Thankfully, with this carbonating bottle, you can simply pop it into the dishwasher after each use. They are made of BPA free PEN plastic. However, some users have complained about how putting this bottle in the dishwasher still changed its shape. Finally, simply buying another carbonating bottle is a good idea for the families that drink a lot of sparkling water per day since you won’t need to wash the bottle constantly but rather only more or less once per day. Also, if ever you want to have guests over or are hosting a party, you’ll probably need more than the 1L of carbonating water to quench everyone’s thirst. While this isn’t absolutely necessary, especially if you already have a 130L carbonator, it can be very handy if you consume a lot of soda since it essentially cuts the amount of trips you need to make to refill your carbonators in half or more. Unfortunately, these aren’t free and do cost $30 for the 60L variant and $50 for the 130L version. While this may seem expensive, it is important to consider the fact that they do come filled with CO2 which saves you from one exchange fee. This cuts the cost of the carbonators in half or more since and exchange for the 60L version costs $15 and $30 for the 130L variant. 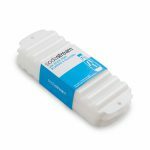 This brings the cost down to $15 for the 60L one and $20 for the 130L one. When taking that into account, the carbonators seem much more affordable and can be worth the investment to save you from part of the hassle of going to a store to refill your carbonators. It is especially ideal for people who live far away from an exchange location since they will have to go out of their way much less often. For example, for a family of 4 that consumes 2L of sparkling water per day, buying an additional 60L carbonator will mean they will have to go refill their carbonators 6 times instead of 12. This saves you some of your precious time. To sum it up, buying an extra carbonator can be a worthwhile investment for those who live far away from an exchange location or those who consume a lot of sparkling water. 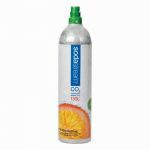 The 60L and 130L versions can be bought on the SodaStream website and on Amazon. Remember that they do come with one fill of CO2, essentially cutting their cost in half. If you are considering buying a 130L carbonator that costs less to refill than the 60L one, make sure to check if your soda maker is compatible with them. To do so, go to their review page on this website and look at specifications section. On top of extra SodaStream bottles and carbonators, you can also buy these 3 accessories that really let you make the most of your soda maker. The first on this list is the SodaStream stainless steel bottle caps. These are sturdier alternatives to the standard plastic bottle caps that come with most carbonating bottles. Like the other bottle caps, they also offer hermetic seals but they are much less prone to breaking and can easily rejuvenate an old bottle. If you don’t feel like buying a new bottle or a stainless Sodastream bottle, you can simply buy the bottle cap and replace the ones that are already on your carbonating bottles. Next up are the ice stick trays. Instead of conventional ice cubes, SodaStream offers ice stick trays basically trays to make thin ice rectangles. These have advantage over ice cubes, the fact that they can fit into bottles with small openings. While this is handy if you want to simply chill the water in your SodaStream bottles and serve it in them, you could also buy a carafe or other recipient to hold your seltzer water with a big enough opening to accept ice cubes. However, this means cleaning one extra container and, also, most containers of that type will not preserve fizz by providing a hermetic seal so you would need to finish the sparkling water in one sitting. You can definitely find other ice stick trays from other brands that will accomplish exactly the same thing. Finally, for those of you who don’t have and don’t plan on buying a dishwasher safe SodaStream bottle, it would be handy to buy a bottle brush if you do not already have one. 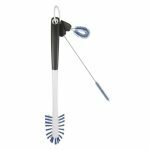 They can be bought on Amazon and will make cleaning your bottle easier and more efficient. The added utility will reduce hassle quite a bit making your whole carbonating experience more enjoyable. The bottle brush is useful whether you have soda maker or a soda siphon since they both use bottles and need to be cleaned. 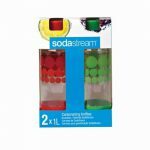 While these can all be handy tools or accessories for SodaStream users, they are not absolutely necessary to enjoy your carbonating experience. Nonetheless, it is a good idea to read the list and find which ones would be the most useful for you. Even though they cost a bit of money, consider it as an investment that will allow you to save time and efforts.